This picture was taken at a Connected Riding clinic I taught in 2014. I snapped this shot before the clinic began, while people were milling about the arena. 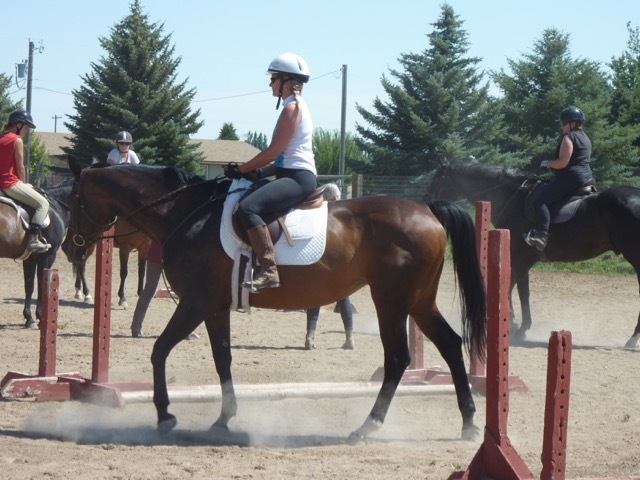 Allani, a yoga instructor who has little riding experience, is a fit individual with finely tuned body awareness. When I quizzed her, she believed she was sitting up straight and that her horse felt as if she was walking okay. We can see that her upper body is behind the vertical and the horse is hollow backed and unbalanced. 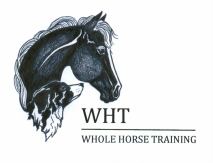 I brought Allani in and balanced her to neutral pelvis, showed her how to cuddle the horse’s sides with her legs, and explained what she needed to "float forward"*** a little in her upper body to prevent the horse’s forward movement from pushing her back. I led the horse while explaining this so she could focus on herself. ***Learn more about Connected language and why and how it differs from traditional instruction, in Peggy Cummings' books. This picture was taken about 20 minutes later, after Allani had walked around the arena several times, practicing her new awarenesses. When I first brought her upper body into balance over her pelvis on a horse, she admitted to feeling like she was leaning forward and had her face in the mane. Here we can see that she is becoming relaxed in her postural shifts. She is able to comfortably accept the motion of the horse because she is maintaining neutral pelvis and remembering to buoy*** in her upper body. The horse has responded by softening her topline and rounding up under the rider. The horse’s body is more pliable and capable of lateral bend. The sequencing of her feet is that of a four-beat walk and she is no longer hollow backed. When I quizzed Allani about how she felt, she said she and her horse were fluid and she felt secure and safe.